Before there was Public Enemy, there was Spectrum City, a Long Island sound system founded by Hank Shocklee and featuring a rotating cast of MCs, most notably Carlton Douglas Ridenhour (Chuck D) and Aaron Allen (Butch Cassidy). 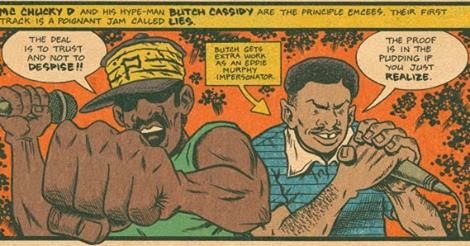 As illustrated above, the two MCs teamed up on the 1984 single, "Lies," released on the Vanguard label. The single's other track, "Check Out the Radio," might sound oddly familiar to some who've never heard it; that's because its chorus, "Got to check out the ra-di-o..." was interpolated by the Wu-Tang Clan for their song,"The W," from Iron Flag. Download both Spectrum City songs, along with the rest of the single, including a radio edit and two dub versions, here; learn more about the group by watching the documentary trailer below; and for the full story on Spectrum City's lesser known MC, Butch Cassidy, read this interview with Aaron Allen himself. Is there a full-length film??? Thank you! Those tapes are great and long overdue for a post of their own. I've been meaning to sit down and try to put together a tracklist for them. Any help anyone can offer there would be greatly appreciated.